There is no question that living in Arizona has many benefits. There is the amazing weather, the great people, the amazing outdoor adventures, and the almost year-round availability of freshly grown produce and other farm products. Our desert climate allows local farmers to operate in all four seasons which means many of our farmer’s markets never close their doors at the end of the growing season since ours never ends. Nothing beats fresh local produce during the winter months. Throughout December, look for in season produce including clementines, carrots, sweet potatoes, lemons, and spinach. Once we enter the New Year, celery, strawberries, and garlic will also be available. March brings fresh asparagus and zucchini blossoms. For a full list of what is in season throughout Arizona during the winter months, check the list of Arizona Produce in Season on Fill Your Plate. Here are some of the markets that continue to operate throughout the winter and some of the Arizona Farm Bureau members offer their products at these winter venues. Date: Fridays Will be closed the week of Thanksgiving and will reopen the following Friday. 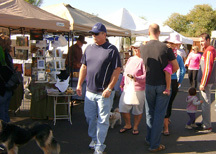 This entry was posted in Arizona Food and Farm Events, Farmer's Markets and tagged American Farm Bureau Federation, Arizona, Arizona Farm Bureau, Farmers' market, United States. Bookmark the permalink.